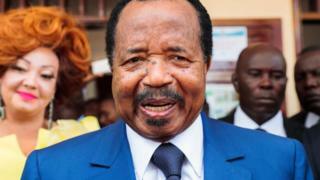 Mr Biya, at 85 sub-Saharan Africa's oldest leader, took 71.3% of the vote, according to official results. Cameroon's Anglophone crisis: Who are the rebels? Mr Biya's nearest challenger, Maurice Kamto of the MRC/CRM, gained just 14.2%. Mr Biya took the majority of votes in all but one of Cameroon's 10 regions, losing out to Mr Kamto by a small margin in the Littoral region which is home to the economic capital, Douala. Threats of violence made against would-be voters by rebels in the Anglophone regions reportedly deterred many from casting their ballot. On election day, three separatists who were accused of opening fire on passers-by were shot dead by security forces. Some rebels also tried to disrupt the transporting of ballot boxes by calling for a total ban on all travel. Seats reserved for opposition representatives at the constitutional council were left empty as the results of the 7 October presidential election were read out, the BBC's Randy Joe Sa'ah reports from Yaoundé. Election observers from the African Union reported that the polls were "generally peaceful" but added that "most parties were not represented" when it came to who was allowed to oversee voting and ballot counts at polling stations.